10/9/2018 DETROIT, Mich. (October 9, 2018) - Tickets for the 2019 Chevrolet Detroit Grand Prix presented by Lear go on sale TODAY, beginning at 7 am ET. The 30th Grand Prix event in Detroit will take place at the Raceway at Belle Isle Park, May 31-June 2, 2019 as the popular annual event will once again wave the green flag on summertime in the Motor City. Fans can purchase tickets to the three-day festival on Belle Isle by visiting www.DetroitGP.com/Tickets or by calling the Ticket Hotline at 866-464-PRIX (7749). With tickets starting as low as $45, fans will have more access than ever before at the 2019 Grand Prix. All ticketholders will be able to visit the Fifth Third Bank Paddock without having to purchase a separate paddock pass. In the paddock - known as the "locker room of motorsports" - fans can get up close to their favorite teams and drivers all weekend long on Belle Isle. Along with the access to the paddock, everyone will be able to visit the historic James Scott Memorial Fountain where fans can enjoy the beauty of the iconic 93-year-old fountain and join in the excitement and celebration after every race at the Autotrader Winner's Circle throughout Grand Prix weekend. Fans will also have more options to view the exciting on-track action at the 2019 Grand Prix with new locations for grandstands and more viewing areas throughout the venue. The Cars.com Grandstand 1 will now be located on the driver's left side of the track, across from Blue Cross Blue Shield pit lane. This change will allow fans a better view of all of the action coming down the front stretch at the start/finish line, heading into Turn 1 and on pit lane. Turn 3 will now have double the seating available for fans in one of the most exciting turns on the track. Grandstand 3 on the driver's left side of the track will offer value-priced Reserved Grandstand seating while the new Grandstand 4 located inside the venue on driver's right side of the circuit will be a General Admission grandstand. With the new Oudolf Garden coming to Belle Isle, there will no longer be a grandstand positioned in Turn 5. A new General Admission Grandstand 7 will be located in the horseshoe area at Turn 7, giving fans an opportunity to see the cars coming off the fastest part of the track. 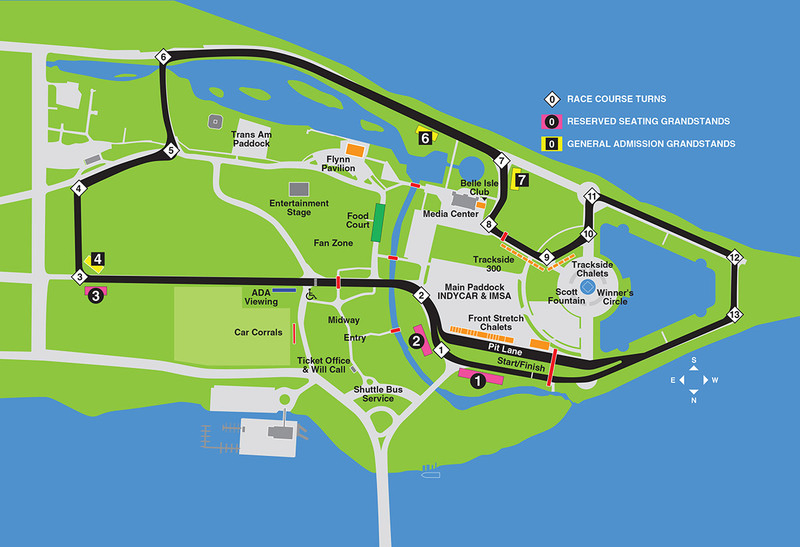 For more information on all of the changes coming to the Grand Prix in 2019 visit http://detroitgp.com/eventinfo/2019-changes.cfm. Tickets for the 2019 Grand Prix start at just $45 for single-day General Admission on Saturday, June 1 or Sunday, June 2. Grand Prix attendees will once again enjoy one of the most diverse and exciting on-track lineups in racing on the challenging Belle Isle street circuit. The Grand Prix will continue to host the only doubleheader weekend on the IndyCar Series schedule - the Chevrolet Dual in Detroit - along with the exotic sports cars of the IMSA WeatherTech SportsCar Championship in the Chevrolet Sports Car Classic on Saturday afternoon and a doubleheader weekend for the Trans Am Series presented by Pirelli. The SST truck series will not compete on Belle Isle next summer. The 2019 event weekend will honor the 30th Detroit Grand Prix with some special events and activities planned to celebrate the heritage of racing in the Motor City. Round-trip bus service from the two designated pick up and drop off locations in downtown Detroit to Belle Isle Park will once again be included with every ticket to the Grand Prix. A Grand Prix tradition will continue in 2019 with the return of Comerica Bank Free Prix Day, which will allow everyone access to the venue for all of the on-track and off-track activities on Friday, May 31, free of charge. Single-day tickets for Saturday and Sunday of Grand Prix weekend start at $45 for General Admission and $80 for two-day General Admission. Children 12 and under are admitted into the General Admission seating areas free of charge with a ticket-bearing adult; limit two children per adult. Single-day Reserved Grandstand tickets start at just $55 for the value-priced Grandstand 3 and $70 for Cars.com Grandstand 1 and City of Windsor Grandstand 2. Fans looking for an enhanced ticket package can purchase passes to the exclusive Belle Isle Club or tickets in the Prix-mium Seating section of Grandstand 1. The Belle Isle Club offers ticketholders a premiere opportunity to enjoy all the on-track action next to the track at Turn 8 with closed-circuit TV coverage and food and beverages - including beer and wine - adjacent to the historic Belle Isle Casino. Belle Isle Club guests will also have access to a private grandstand next to the track within the Club area and an option to receive an on-island parking pass offered on a first-come, first-serve basis. Belle Isle Club tickets start at $200 for a single day and $375 for a two-day experience. The Prix-mium Seating section will be located at the top of Grandstand 1, across from pit lane, with great views of the front stretch, the start-finish line, pit lane and Turn 1, and will include a padded seat and additional leg room for $110 per ticket each day. Fans that want to enjoy the Grand Prix while showcasing their own vehicles with other like-minded car enthusiasts can purchase tickets to the Car Corrals. Packages include a premium on-island parking pass and a grandstand ticket. Visit www.DetroitGP.com/Corrals to see all of the car corral options for the 2019 Grand Prix. In addition to all the great racing, the Grand Prix will continue to feature plenty of entertainment options away from the track for fans of all ages. The Meijer Fan Zone will once again include displays and interactive experiences including autograph sessions with the racing stars competing at the Grand Prix. The Grand Prix Party Pit will feature tailgating games and family fun throughout the weekend. Live music will also be featured at the Grand Prix with a full schedule of performances to be announced closer to the 2019 event weekend. Two-time Detroit Grand Prix champion and defending Indianapolis 500 winner Will Power of Team Penske is in Detroit on Tuesday to help celebrate tickets to the 2019 Grand Prix going on sale. Tickets for the 2019 Chevrolet Detroit Grand Prix presented by Lear can be purchased online at www.DetroitGP.com/Tickets, through the ticket hotline at 866-464-PRIX (7749) or in person at the Grand Prix box office located in the GM Renaissance Center above the GM Wintergarden, 300 Renaissance Center Drive, Suite 2311, in downtown Detroit.